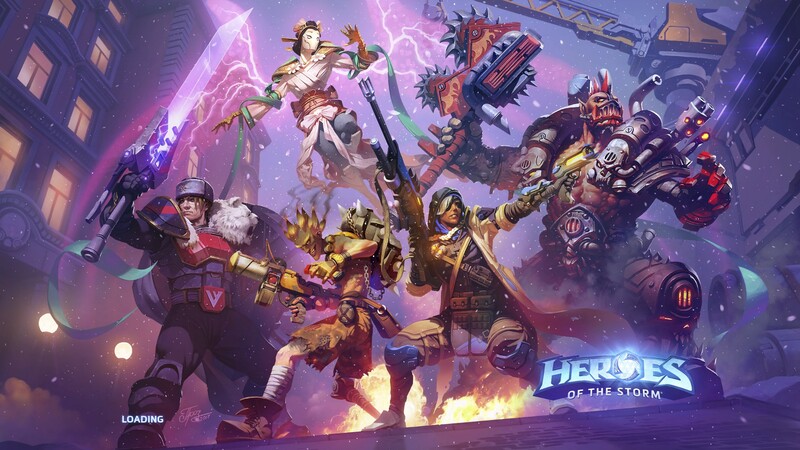 Heroes of the Nexus shall assemble within the foundries of Volskyia Industries with the latest in-game event for Blizzard’s MOBA. Bringing a brand new Overwatch themed Map (Volskyia Foundry), the elder sniper Anna from OW, a brand new A.I system and an in-game Pachimari limited time quest this event is a substantial amount of content for a game that has such a frequent release cycle. Seasoned sniper Ana enters the nexus with her trust biotic rifle and grenades on hand to lend support to her team. Her basic abilities allow players to shoot syringes full of healing serum at friendly targets or inflict poisonousness wounds that deal damage over time to enemy units. Biotic Grenade can either heal friendly units for a large amount or stop enemy heroes from receiving healing for a limited time. Her passive trait is pretty interesting, it is almost like Lunara’s poison, in that it applies DOT (damage over time) to those hit. Unlike Lunara’s basic attack trait, Ana’s can stack up to five times on a single target. Healing Dart – First dart to hit a friendly hero heals for 250. Biotic Grenade – Heal Heroes in range for 175 + they gain an additional 25% healing for next 4 seconds. Enemies hit with Biotic Grenade cannot receive healing for 2 seconds and take 60 DMG. Sleep Dart – Put an enemy hero to sleep for 3 seconds, Attacking the same hero with a basic attack from any source causes them to wake up. 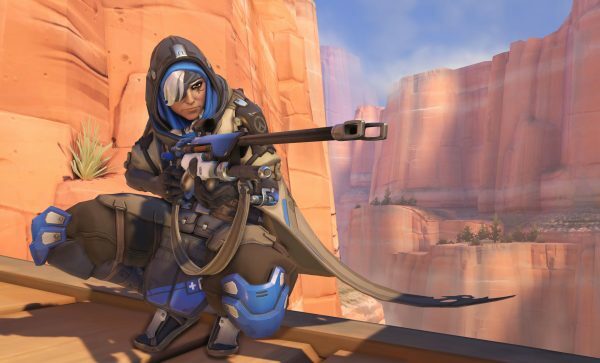 Nano Boost (Ultimate) – Ana recovers 200 mana, friendly hero affected by Nano Boost 30% spell power and their basic ability cooldowns have a refresh % of 150%. Eye of Horus (Ultimate) – Fire up to 8 specialized rounds. Enemies hit with rounds from Eye of Horus take 175 DMG, friendlies hit by Eye of Horus take additional 300 points healing. Ana is not able to move while using this ultimate. 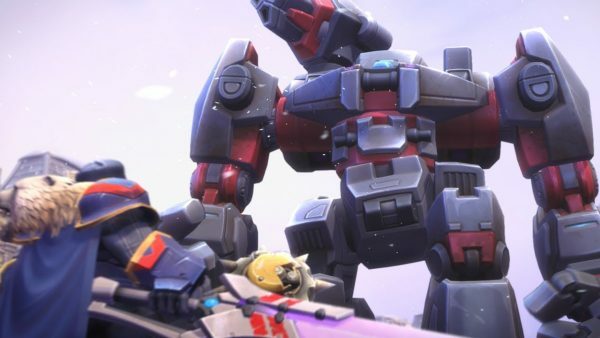 Travel to the futuristic tundra of a Russian foundry in this brand new Overwatch map for Heroes of the Storm. Unlike the currently pulled from rotation Hanamura map, Foundry has only one objective active at a time. With a small King of the Hill style objective point – each team must strategize effectively to control the objective or risk losing it to their opponents. Just like in Overwatch a contested point can go into a nail-biting overtime. Your team’s reward for holding the control point? The ability for two players at once to control a giant mech and march it straight to the enemy base. 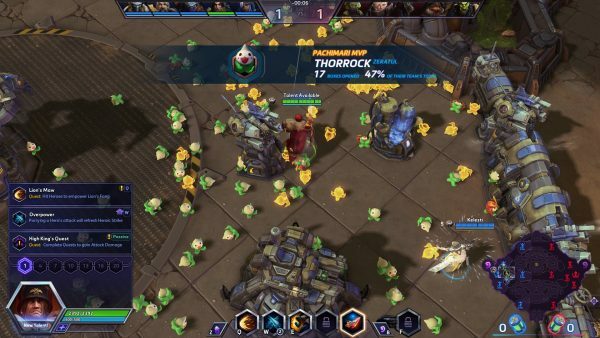 For the next little while, a personal favorite of mine – Overwatch’s little Pachimari plush – will be collectible in Heroes of the Storm. At the start of a match, dozens of loot boxes will spawn on the field and the team that collects the highest number of Pachimari during those opening seconds are rewarded with progress towards the event quest. Not only do these event boxes contain “legendary” gold Pachimari but a “Pachimari MVP” is crowned before the gates come down to begin the match! What do you think of this HOTS event? Let me know in the comments section!